Installation at Queensland Museum for World Science Day, 9 to 13 March, 2016. Emma Lindsay is a Brisbane-based artist whose paintings explore the relationship between nature and culture, and the replacement of the natural environment with synthetic imitations.1 Her interest in depicting the taxidermied bodies of rare and extinct Australian birds was sparked in 2007 by a visit to the Queensland Museum collection archive, where she first viewed a specimen of the elusive Night Parrot.2 Since that time, Lindsay has focused on painting images of the preserved bodies of birds and mammals. One of these paintings, King Island Emu (Dromaius ater) Musée national d’Histoire naturelle (France), will be displayed on the Art Museum’s New to the Collection wall during July 2016. 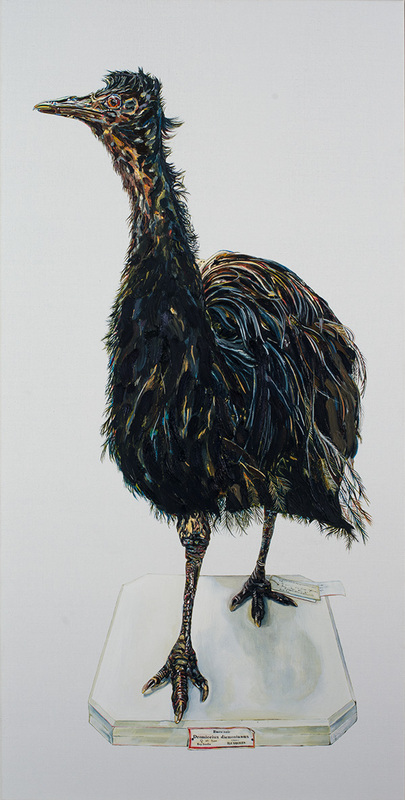 In this work, Lindsay has used lively strokes of colour to capture the King Island Emu’s delicate plumage and distinctive blue skin that lies beneath its neck feathers. This significant specimen, which is housed in the Muséum national d’Histoire naturelle, Paris, was collected during French explorer Nicolas Baudin’s expedition of 1800 to 1804 to map of the coast of New Holland (Baudin died in 1803 on the return voyage). The emu was exploited by seal hunters living on King Island – they trained dogs to hunt the birds and devised recipes to make best use of their meat.5 By 1805, the King Island Emu had been driven to extinction in the wild, only three years after it was first identified. Animal extinction is a particularly pertinent conservation issue for Australia. Most of our native wildlife is unique to the continent, yet over 1,700 species have been identified by the Australian Government as being at risk of extinction.8 It is also regrettable that many of these extinct species, once unique to Australia, can only be viewed in international collections. In sharing her rare perspective, Lindsay invites her audience to see birds that they will never have the opportunity to view in the wild, and may not realise ever existed. Through her vivid, tactile paintings, Lindsay communicates the realities of mass extinction that have occurred as the result of hunting, culling, habitat loss and predation by feral animals.9 In viewing her work, we simultaneously marvel at the wonder of nature while grieving for what has been lost. Emma Lindsay graduated in 2009 from Queensland College of Art with a Bachelor of Fine Art majoring in Painting (First Class Honours). The following year, she was awarded an Australia Council Artstart Grant and a Judith Wright Centre of Contemporary Arts and Arts Queensland Fresh Ground Grant and Residency. Other residencies include the BAER Art Centre Artist Residency and the Hill End Residency through the Bathurst Regional Art Gallery (both 2011). In 2016, she completed her practice-based PhD (Fine and Studio Arts) at RMIT, Melbourne. Her research topic, ‘Visualising extinction’, focused on Australian native birds. 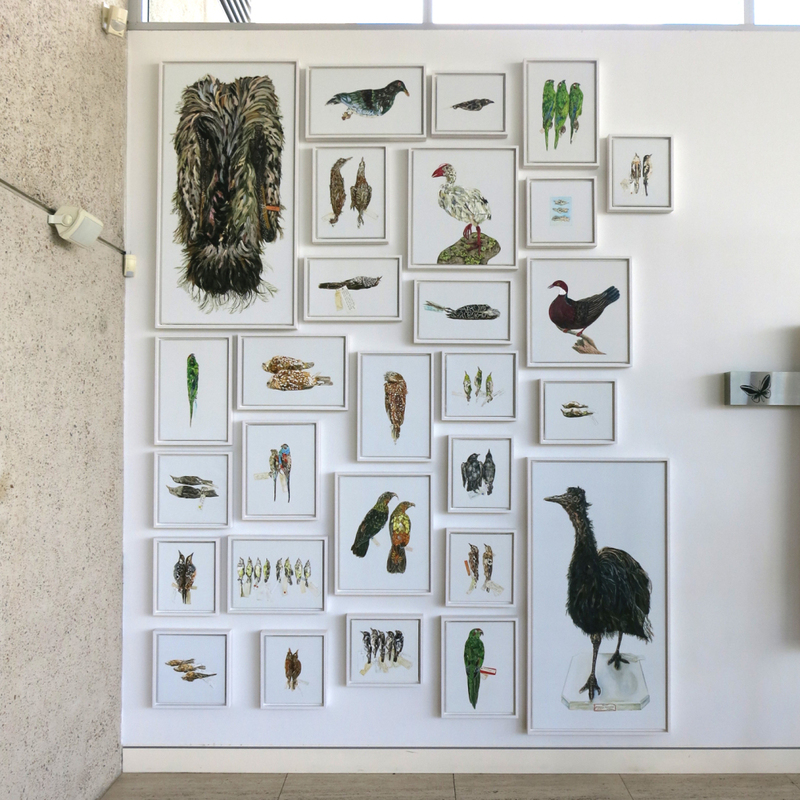 Twenty-nine of the paintings created during this project were displayed in the foyer of the Queensland Museum as part of the 2016 World Science Festival ‘On a wing’ program. Reproduced courtesy of the artist and Heiser Gallery, Brisbane. 1. Australia Council for the Arts, “Emma Lindsay Visual Arts,” ArtStarters, http://www.artstartgrant.com.au/ArtStarters/Previous/32?name=Emma%20Lindsay. 2. Emma Lindsay, “Artist Statement,” Emma Lindsay, http://emmalindsayartist.wordpress.com/about/. 3. Jordan Ogg, “Emma Lindsay: The extinction project,” The Island Review, http://www.theislandreview.com/emma-lindsay-extinction-project/. 4. Emma Lindsay, “Artist’s statement,” artist file, UQ Art Museum, University of Queensland, 2013. 5. Tim H Heupink, Leon Huynen, and David M. Lambert, ‘Ancient DNA Suggests Dwarf and ‘Giant’ Emu Are Conspecific,’ Public Library of Science One, https://www.ncbi.nlm.nih.gov/pmc/articles/PMC3073985/. 6. Email from Bruce Heiser, 31 March 2016, UQ Art Museum artist’s file. 7. Emma Lindsay quoted by Ogg, ibid. 8. Australian Wildlife Conservancy, “Wildlife,” http://www.australianwildlife.org/wildlife.aspx. 9. The themes explored in Lindsay’s paintings are reminiscent of Rachel Carson’s book Silent spring 1962 in which she uncovered the disastrous impact of pesticides on bird populations. Tags: Emma Lindsay. Bookmark the permalink.